Steve Sundram is an internationally renowned for his visionary environmental imagery which is licensed throughout the world on numerous gift and stationary products. His original paintings are in the homes of collectors around the world. A few of his celebrity portraits include Kim Basinger, Jack Klugman and Carlos Santana. In Maui, Hawaii, twelve mural-scale paintings, a year in the making, have graced the lobby of the award winning Hawaiian-themed stage spectacular "Ulalena" for over three thousand performances since 2006. "Steve's paintings truly capture the depth of Hawaiian history and culture," says Ulalena's General Manager Dennis Preussler. In 1979 at the age of sixteen Steve left his native Australia with the aim of encountering as many different cultures as possible, drawing and painting what he saw and experienced along the way. Extended travels in India, Bali, Japan and New Zealand gave him a profound experience of Asian-Pacific lifestyles and landscapes which provided inspiration for his developing talents. The Australian Wildlife Association gave Steve his first one-man show in 1981 and Good Morning Australia introduced him and his work to a national TV audience. In 1988 Steve completed a series of thirteen epic oil paintings depicting the Aboriginal Dreamtime. Burnum Burnum, the internationally famous Aboriginal storyteller and spokesman, helped guide Steve with the various ancient dreamtime legends. The opening celebration at The Rocks, Sydney's historic waterfront precinct, was widely covered by the Australian media and sponsored by Richmond Grove wines. The series were published and sold throughout Australia as fine art prints and note cards. In 1990, Steve moved to the Hawaiian Islands, a place of dreams nurtured by stories from his mother, and immediately fell in love with the culture, land, and people. He has been a full-time resident of Maui ever since. In 1995, Island Heritage, Hawaii’s leading publisher, commissioned Steve to illustrate "The Whales Who Won the Heart of the World," which went on to become the top-selling children's book in the state of Hawaii in 1996. 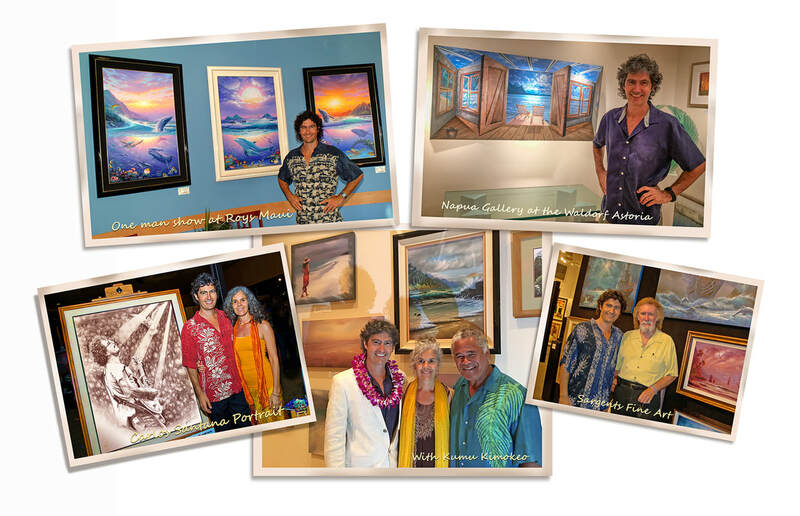 For the last eighteen years Island Heritage has featured Steve's images on numerous stationary and gift products sold throughout Hawaii, offering vivid mementos of the spirit of the islands. In 2007 Steve created “Myths of the Seven Seas” and “Nostalgic” two stunning series of paintings that have a vintage feel, exploring the era of tall ships, legends of the high seas and early century landscapes. In 2010 the Hilton Waikoloa Resort, Hawaii selected Sundram's "Atmospheric Landscape" series to be displayed in over one hundred and sixty rooms in their resort hotel. December 2013 Steve auctioned off one of his prized original paintings "Dolphin Dreams" thru CharityBuzz, to help raise funds and awareness for the work of Ric O'Barry, featured in the Academy Award–winning documentary, The Cove, and for "Save Japan Dolphins”, to end the largest dolphin slaughter on the planet. Steve also produced an entertaining time-lapse video entitled "Dolphin Dreams" that shows the month long creation of the dolphin painting within a speed lapsed two minutes film, from start to finish. (view film on video promo's page). In 2014 Steve painted "Voyaging Expedition", inspired by "Hōkūle‘a", the famous Hawaiian hand crafted raft. After reading and watching news videos about the Hawaiian's daring and fearless endeavor he set to work on an epic painting that has now been published by Island Heritage. Using nothing but traditional non-instrumental navigation techniques, members of the Polynesian Voyaging Society are embarking on a multi-year journey around the world on board Hawaii's legendary Hōkūle‘a canoe. 2018 - Worldwide Branding - Steve has joined forces with Lifestyle Licensing International, to create a worldwide licensing program, managed by Lifestyle Licensing International, a licensing, consulting and marketing firm recognized industry leaders with a proven track record in developing, building and maximizing strong brands.